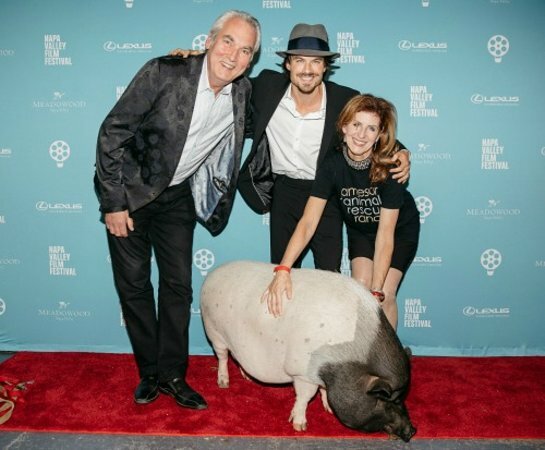 Celebrity activist couple, Ian Somerhalder and Nikki Reed, were presented with the Jameson Animal Rescue Ranch Humanitarian Award on Thursday, November 9, at the Lincoln Theater in Yountville as part of the 7th Annual Napa Valley Film Festival. JARR Co-founders, Monica and David Stevens presented an etched Robert Foley Vineyards, Howell Mountain Cabernet 3Liter, 2013 on stage with a special guest, a pig called Mr Moo who clearly stole the show. The Jameson Animal Rescue Ranch Humanitarian Award celebrates those individuals who have shown outstanding compassion, advocacy and dedication to animal protection issues. The recipients, actors Ian Somerhalder (Vampire Diaries, Lost) and Nikki Reed (The Twilight Saga, Twilight, Thirteen), exemplify JARR’s mission to show compassion to all animals in need and by using their unique platform to bring a spotlight to animal welfare issues help further the work to end animal cruelty in all it’s forms. Visit the JARR website here for more info on their work with companion and farmed animals in need.